The Baldur's Gate Countdown Begins! A mysterious 24-hour countdown is now ticking away at the new Baldur's Gate website. Nobody was quite sure what to make of it when a strange new Baldur's Gate website popped up back at the end of February. There was nothing to it but the famous Baldur's Gate skull, theme song and some words from the wise Alaundo about how the Lord of Murder shall perish and yadda yadda. But hidden in the page's source code were some rather more interesting messages. "For years, I clung to the memory of it. Then the memory of the memory" was one, instantly recognizable as the words of Joneleth Irenicus, bad guy numero uno of Baldur's Gate 2. "Love is a lie. Only hate endures" was in there was well, which according to the Forgotten Realms Wiki is part of the dogma of the goddess Shar, worshipped by Viconia DeVir. "If you wish me dead, brother, it must be by your hand. No one else" sounds very much like Sarevok, Bhaalspawn and chief troublemaker of the original Baldur's Gate, although nobody seems to have quite nailed that one down yet. There were a few others as well, perhaps the most intriguing being an invitation to search for hints. "Pore over the tapestries and works of art hanging from our walls if you wish, Child of Bhaal," it said. "Perhaps you will find a clue. But patience, ah... patience would reveal it all." And all will soon be revealed, as a countdown is now ticking away at the site and has, at the time of writing, a little over 14 hours on the clock. What could it be? The leading theory, at least the last time I checked, points at an HD remake for tablets, but references to the game in the Steam registry led some people to conclude that a Steam release is imminent. That claim was quickly denied by Beamdog, a studio founded by BioWare veteran Trent Oster which is apparently somehow involved in all this. 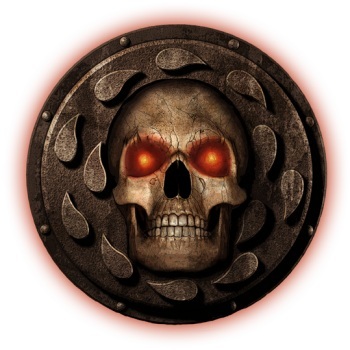 Beamdog, for the record, has previously ported the BioWare game MDK2 to the Wii; Oster was a modeller on the original Baldur's Gate. I continue to believe that Baldur's Gate 3 is the only possible explanation and thus look forward to the wild paroxysms of joy that will inevitably begin at 3 pm EST, when the next chapter in the greatest Dungeons & Dragons CRPG of all time is announced to the world. It's going to be great, so don't miss the moment - join me in watching the clock tick down at baldursgate.com. Thanks to LavaLampBamboo for the tip.